If we all knew how long we were going to live, planning our finances would be easy. Many people base their estimate on how long their family lived. This can be a good indicator as long as your parents died of natural causes and lived a simalir life to your own. We now know that this comparison is not always accurate. With improvements in food, medical treatment and knowledge about how to take care of ourselves, we are all living longer. 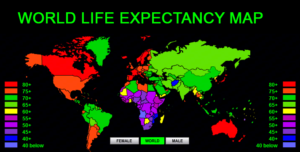 The question now is what is your real life expectancy and how will you plan for it financially? The first step is to figure out your life expectancy based on genetics. Let’s assume both parents lived to age 75. It could be an easy assumption that their children will live until around age 75 as well. With the help of a financial advisor you could use this age as a guide to calculate how much money to take out if your savings so that it will last until your demise. This is a first step only. You may find you have to work a bit longer to achieve the life style you want while in retirement. Or you have sufficient savings already. Now assume you will live 10 years longer. Better food, better medical care and a healthier life style could contribute to living 10 or even 20 years longer than your relatives! Adjust your financial plan for a longer period. Will you have sufficient funds? Will you need to work longer and save more? Perhaps you will need to cut back on expenses to ensure a comfortable life style as you live longer. Do your analysis now and make some informed decisions to ensue you have sufficient funds to meet your extended life expectancy! This entry was posted in Fin Independence and tagged Life Expectancy on 2017/08/21 by ernie.